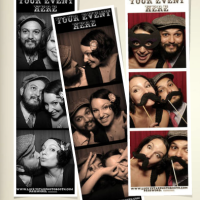 Make the Memories Last Forever with Photo Booth Rentals in NY! Smiling and posing for pictures is the best part of any event. 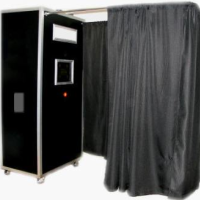 Consider renting a photo booth for your next party. Use our guide to find the best photo booth rentals in NY. Your guests will love hopping into the booth to take photos with silly props and fun backgrounds. KidsParties.Party also lists photo booth rentals in New York by city and county, as well as all types of party rentals for children. Top Line Parties and Events is a party rental and entertainment company. We supply party rentals such as photo booths, inflatable bounce houses, games, obstacle courses, tent rentals, tables, chairs, mechanical bulls, bumper cars, and much more. We also have entertainers and concessions such as magicians, clowns, balloon twisters, face painters, cotton candy, pop corn, snow cones, pretzels, nachos, hot dog machines and almost anything else you could want or need at your next event. Call to book us for your next event, big or small. Great Quality at an Affordable Price in NY! 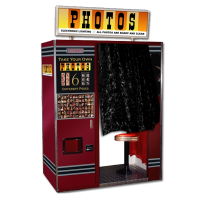 By using the latest photography technology, Hollywood Photo Booths offers high-quality photo prints at an affordable price. With this photo booth rental in NY, you will receive an all-inclusive party package with an on-site photo operator, unlimited photo strips in black and white, color or sepia, a logo on all the strips, a DVD montage, and more. There is a lot you can do with the photo strips - consider creating photo favors, a photo guest book, posters, picture frames, and more. There are endless options with Hollywood Photo Booths! Huge selection of Photo Booths available for parties! 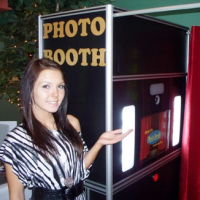 ISH Events is one of the most popular photo booth rental companies in the Long Island, New York. They provide rental services to all of Long Island, as well as parts of NJ, NY and CT, call to check availability in your area! Over the years, ISH Events has become the leader in photo booth rentals due to the modern and advanced machines they provide. They offer a wide variety of styles, ranging in shape, size, mobility and the number of people that can fit inside. Photo Booth options include Stand-Up Booth, Traditional Booth, Elite Booth, Basic Photo Station, InstaPic Station and a Green Screen Station. Take advantage of their other options including adding a custom logo to strip prints, a scrap book for a take-home keepsake or a video message. Props are included at your request to add extra fun to the photo shoot! Capture the moments of your special event! Call ISH Events today for availability and price. A Hand-Crafted 1920's Photo Booth in NY! Your party guests will have a blast taking silly pictures in this one-of-a-kind NY photo booth from Luckystar Photobooth! Inspired by the 1920's, and hand-built in a custom design, this photo booth company is sure to offer an experience that you have never-before seen. With the photo booth rental, you will get unlimited prints in black and white, color or sepia, props, a guest book, an event CD, a custom logo for each print, online image hosting, and friendly attendants to run the booth. Not only do they offer simple photo booth pictures, but they also offer video montages, posters, customized cards, keepsake books, enlarged prints, and more photo memory options. Modern Photo Booths in NY! 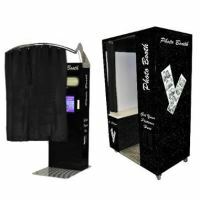 As a high-tech and high-fashion photo booth company in NY, IncrediBooths offers many different sizes and options when it comes to renting your photo booth. Choose between the Vanity Booth that fits 2-5 people, the Entourage Booth that fits 3-6 people, and the Capture Curve that fits 4-8 people. You can also choose between a selection of custom logos for the top of the pictures, or even create your own! 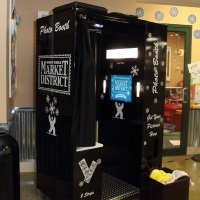 The photo booth rental packages include four hours of operation, custom graphics, unlimited photos, color or black and white photos, a photo scrapbook, a slideshow screen, LED roof lighting, and much more. 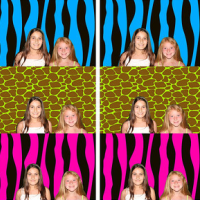 Custom Picture Backgrounds in NY! This premium and professional photo booth rental in NY offers unique party options that set them apart from others. Royal Photo Booth offers photo booths that can hold up to 12 people, and they also offer green screens so you can add any background to the pictures! You also have the option of renting either a enclosed photo booth or an "open air" photo booth. With no location limitations and an affordable price, it is easy to realize that Royal Photo Booth is the photo booth rental company for you! The party packages provide a professional on-site photo specialist, unlimited photo sessions, a custom message, an online gallery, and much more. Many Photo Printing Options in NY! 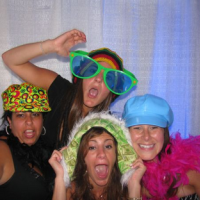 Offering lasting memories and awesome photos, NYC Photobooth is a top photo booth rental in NY. No matter how old you are, taking silly pictures in a photo booth with friends and family is a great time. With party packages including four hours of rental, a photo specialist, personalized photo backgrounds and graphics, and more, you are sure to get a great deal with NYC Photobooth. Not only do you have the option of choosing between numerous different types of photo booths, but you can also choose to include photo books, video recording, a poster, and more to your photo package. High-Quality Photo Prints in NY! Adding laughter, priceless fun and unforgettable memories to your kid's party, Say Cheeeese Photo Booth is a perfect way to make your party special and memorable. The high-quality Canon cameras will miraculously produce professional photo prints in less than six seconds! No matter how old, your guests will absolutely love Say Cheeeese Photo Booth! With three different packages, you can have a variety of options and prices to choose from. Each package includes a four hour rental, 2 picture copies for each booth visit, an attendant to run the booth, and much more. Finding a high-quality photo booth company in NY at an affordable price may be challenging, but look no further! Upstate Photo Booths offers all-inclusive party packages equip with four hours with the top-notch photo booth, an on-site photo technician, a personal logo on each strip, unlimited photo strips, and a photo CD. Upstate Photo Booths will spice up any kid's party with their fun-filled photo booth entertainment and photo party favors. Contact them to ask about your kid's party today!